Abandoned at the altar, Kelly Grace Pickens finds herself left holding not only the bouquet, but also the exorbitant bill for an A-list wedding. Homeless, a once-promising singing career floundering, and her life bearing an uncanny resemblance to one of her country music ballads, she reluctantly accepts a last-minute offer to appear on a reality TV show akin to The Bachelor. Pitted against silicon-enhanced supermodels in four-inch heels, Kelly feels confident that she will be among the first would-be fiancées to be excused. Only, when the mysterious bachelor from New York City, Dillon Black, invites her to stay, Kelly finds herself thrust into the vortex of a game she doesn’t have the first idea how to play. Nursing her hopelessly broken heart while avoiding the foils of her fellow contestants, Kelly is oblivious to Dillon’s affections as she wades through hurt and betrayal to discover, in the end, that she has landed firmly on both feet. I'll admit, I have never seen The Bachelor or any of the other reality TV shows like it. But I was intrigued when I read the synopsis for Count Down to Love. I am happy I read it. I really enjoyed reading it! Kelly Grace is is left at the alter by her slime-ball of a fiance. He has also left her with tons of debt and a lot of self doubt. To make some money, she agrees to help out her cousin who is a producer and goes on a Bachelor type show called Count Down to Love. Kelly has basically lived her whole life with people telling her who she is supposed to be. Her mother is constantly telling her she isn't good enough. Her ex- fiance led her away from her true passion in nursing to try to be a super star. Even her cousin makes her into a bimbo model type to be on the show. The only one that wants to see her for herself is Dillon. I liked Dillon a lot. I think he was the only one who really saw through to the heart of who Kelly was inside. Their relationship was fun to watch. I thought they were great together and really brought out the best in each other. Over the course of the competition, Kelly really matures and grows into herself. Dillon learns a little something about himself along the way as well. I won't give away the end, but I thought it was just perfect. 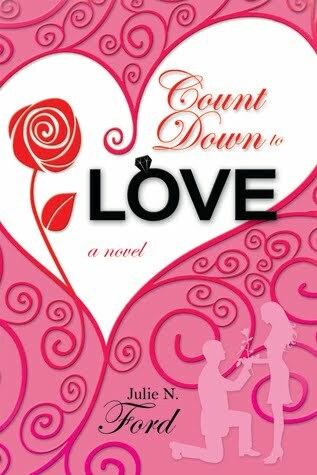 I definitely recommend Count Down to Love. It was a really great and clean little romance that just makes you sigh with contentment when it is over. Julie has a Bachelor of Arts Degree in Political Science and a minor in English Literature from San Diego State University. In addition, she earned a Masters in Social Work from the University of Alabama. Professionally, she has worked in teaching, childbirth education and family therapy. Along with Who I Am, she is the author of two other Women?s Fiction novels due for release in March and November of 2011. Currently, she lives in Nashville, TN with her husband, two daughters and one very feisty fish.